There’s a powerful saying from Martin Luther King that says, “Take the first step in faith”. You don’t have to see the whole staircase, just take the first step.” This is how I felt when I entered the mentorship competition for Power Living’s Hanuman’s Leap of Faith teacher’s retreat in Byron Bay. I knew about the retreat and also knew it was out of my budget at the time, but there was a calling in my heart that I was meant to attend. If it was not to be this one, then certainly I knew I had to attend one in the future. Then I saw the competition promotion via Facebook just before starting a class and very swiftly and effortlessly entered my answers to the questions to be able to win a mentorship with Keenan Crisp on this retreat. I felt immediate excitement when I pressed send about what this future possibility could bring, but and at the same time staying with my yoga practice not being attached to the outcome, I sent it off with a centered heart. For the following weeks I talked with friends and family about what an amazing opportunity it would be to win this retreat, as I was certainly feeling ready for further knowledge and to be inspired through yoga philosophy. I kept thinking how wonderful it would be to simply be the student for an entire week after teaching yoga full time for nearly 4 years. When the email from Power Living came through on a Saturday afternoon early February, I got a little bit excited. Finally on the Monday, it was confirmed. I had won! Then time was of the essence to get the Ramayana book in my hands and start reading. The retreat was a truly wonderful experience over all. Being by the beach for the week was absolute bliss and we had time in the middle of each day to enjoy the serenity was refreshing. Also, coming from city life, star gazing each night when the sky was clear was a highlight for me. One the last night I was blessed to witness five shooting stars steam across the Milky Way on the last night – what stunning nature connections! Each day was carefully thought out to incorporate pranayama, meditation, chanting, vinyasa and yin practices, and philosophy evenly. The delicious vegan food we ate daily was very nourishing and cleansing. Being in the space of learning with like-minded people creates a beautiful energy so everyone was open and welcoming to each other. Keenan lead the training in his down-to-earth and relaxed nature and due to the diverse yoga practices we experienced and open group discussions every day, the bond between all of us by the end of the week was strong and heartfelt. As part of the mentorship I was fortunate to be invited to the team meetings at the end of the day with Keenan, Adam and Tracey and had some fantastic conversations with them. The conversations I had with Keenan separately, as well as the group discussions, exercises and yoga practices, gave me personal insights for my life and where I’m at right now. The whole retreat was designed to review and reflect on ourselves and our lives and there were certainly moments where I felt deeply connected to who I am, a feeling of being on the right track, and a few wobbly moments where I felt disconnected, noticing the little self going through disempowerment. We gained further tools to support us through these processes by feeling into the vulnerability to go deeper within so we can learn and emerge with renewed strength, love and acceptance. For me personally, I’ve learnt how important it is to take time to read more, write more and think about all the knowledge that comes my way so that I may share what truly resonates from the heart with a confident and authentic resolve. Continuing forward as a yoga teacher, I feel the training has assisted me to trust the process of surrender so that I’m able to deliver a more powerful class. Where the philosophy lands with the students on a level they are comfortable with and they leave feeling connected to themselves and their lives. 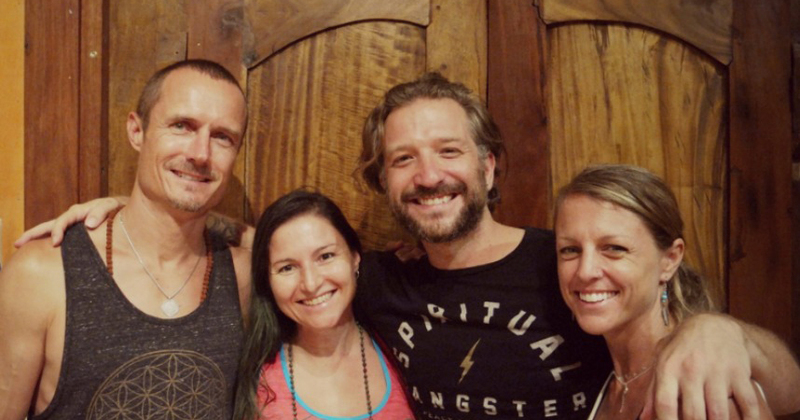 I feel immense gratitude for Keenan, Duncan and Adam, our amazing teachers on the retreat who deliver the yoga teachings with passionate hearts, and huge thanks to Power Living for offering this opportunity for me to train on the 500 hour Teacher Training pathway. I was an absolutely brilliant week and I would recommend it to any teacher for creating good habits of deepening their daily Sadhana, (spiritual practice), and diving into more yoga philosophy.